Certainly one of the stronger Nintendo Downloads in recent memory, today sees a new DSiWare game from Shantae: Risky's Revenge creators WayForward on the same day a well-respected classic hits WiiWare. MDK 2 (Interplay, 1000pts) — Here are some words you don't often see in the Nintendo Download: this BioWare game was originally released on Dreamcast, and is now making its home on WiiWare. The adventures of gun-toting dog Max, mad Dr. Hawkings and sniper Kurt Hectic have attracted much critical acclaim, so hopefully the WiiWare translation will be just as good. Our review will let you know. Mighty Milky Way (WayForward Technologies, 800pts) — A spiritual successor of sorts to Mighty Flip Champs, to find out more before our review you can read our Mighty Milky Way interview with WayForward. GO Series: Tower of Deus (Gamebridge, 200pts) — The latest bite-sized chunk of gaming from the folks at Gamebridge, be sure to read our GO Series: Tower of Deus review for our verdict on this playable platformer. Whack-A-Friend (Agetec Inc., 200pts) — Give the moles a rest — take a picture of your friend instead and whack that. What could be better? We'll let you know in our upcoming review. Whether you're roaming the city or camped out in the comfort of your living room, this week's new downloadable games invite you to virtually venture toward outer space for some wild intergalactic action. Mighty Milky Way for the Nintendo DSiWare™ service sends players on a planet-hopping mission filled with intrigue and adventure. Meanwhile, on the WiiWare™ service, MDK™2 features a trio of unlikely heroes who must join forces to protect Earth from a sinister alien threat. For fresh hand-held fun without the interstellar obstacles, a new retro-styled platformer and an irreverent picture-based game also make their Nintendo DSiWare debut this week. MDK 2? Never knew there was even a part 1. It does look interesting though. Will I be totally lost if I start with the sequel? They should have put the original on Wiiware first. @link79 Nah, you can just jump into this one and you'll know what's going on. I remember playing this on Dreamcast so I'm glad it's out on Wii now! Ah that's why I never heard of it. I never owned a Dreamcast. I watched a few videos of the game and it does look fun. I might consider getting this. Whoa I vaguely remember this title....strange, but it's so hard to remember. I can't remember if I enjoyed it or not . Though I was probably too young still. Please come to PAL MDK2... is it coming to PAL? Tell me again what I'm supposed to be excited about here?!?!? What's the sighing for? This week features at least one quality download on both platforms, and while there's technically no VC, the WiiWare game is essentially a Dreamcast VC entry. Pretty decent week. The sighing is because it's almost been two months since Europe got FF6, and I'm still waiting for it. It shouldn't be taking this long; there have been plenty of crappy weeks they could've release it on. MDK 2 looks like something I might buy somewhere down the road, but I'm incredibly short on funds right now and I can only afford one Wii Shop game for the next couple months. So another week without FF6 is another sigh from me. 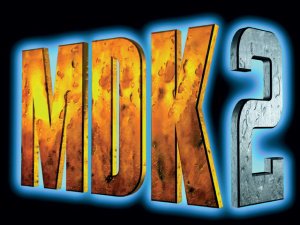 MDK 2 was originally a Dreamcast game? Wow never thought WiiWare would got it and to think Capcom said Dreamcast games like Power Stone and Marvel vs. Capcom 2 isn't possible on the WiiWare. My mistake...MDK2 is freaking awesome! (I will never comment again w/o having knowledge of the game at hand). OMG, where's mah Wii points? I'll wait for the review, but my guess is it will be a broken, crippled port of the Dreamcast game due to the size limit. I'm not too excited. Finally a good update for the americans! I hope it will happen for the PAL-region too. @brooks83: I'm thinking the same. when's the review of MDK 2 due? Mighty MIlky Way for me, obviously. MDK2... need to see more. I don't think there has actually been any videos of Mighty Milky Way in action. It makes me a little fearful of what it will actually end up playing like. I am also having some doubts towards MDK2 and if it will just turn up being a shell of its former self. A little too early to be praising this week in my book. Today is not a day scheduled for being a VC release day. Pay attention to the release schedule! You got Rival Turf! last week and will definitely get a VC game next week. One VC game every two weeks. @brooks83: That's why I'm very curious to find out the block size. Finally MDK2 is out, going to get it after I get home! Okay there are well over a dozen vc games in the queue and it's growing all the time, so why are we still only getting one every two weeks? All those Jeleco games I thought we here in the US would be fortunate enough to avoid have all just been rated by the ESRB which means it could be months before great games like Final Fantasy III, Super Adventure Island and Chrono Trigger show up for download, which makes these weeks of nothing all the more painful to swallow. Can't wait for the MDK2 review. If there are pointer controls for shooting and the port is smooth, I'm definitely picking this up. This is the best week we've had in a long time. sigh. Lack of Mega Man V, as usual, means epic fail. And that's not even mentioning Super Mario World 2, Star Fox (SNES), Earthbounds 1-3, Fire Emblems 1-5 (which are out in Japan and NEED to be translated), Dr. Mario (NES), and Yoshi's Safari. Those are ALL first-party, Nintendo titles, so there is absolutely NO reason why they shouldn't have been released by now, except for blatent laziness on Nintendo's part. Complaining about the lack of VC releases this week is as dumb as complaining that the school bus doesn't come at the weekend. Its just completely the wrong day to expect them. Because MDK2 was reviewed on Classic Game Room, I must buy it for the awesomenessity. @Bass: I guess some people just like to whine and complain. The thing that cracks me up is when Europe gets a VC game everyone thinks NA is going to get that game the following week. Look when Europe got Rival Turf and than look when NA got it that's about how long we are going to have to wait for FF III. If you can't wait that long its not like FF III isn't available on other systems. So get one of those versions and quite whinning about it. Well MDK2 was originally Dreamcast & PC and then followed up on the PS2. Hey, I thought FFIII would be soon released after it was released in Europe too. I'm expecting it to come any time soon now. Maybe even next week. Being released the following week after Europe and vice versa doesn't happen enough to be commonplace. It can happen but isn't to be expected. It is surprising how late it is because of how popular Final Fantasy games are. Six legged dog with blasters=EPIC BUY!!!!! With only 200 points left, Tower of Deus should be fine as the last DSiWare game I buy ... on my DSi. I'll get MMW and a bunch of others later. Also, this is a comments section, not a compliments section. I don't get why you're whining about negative comments. Not everyone has to praise Nintendo for doing a crappy job. @cheetahman91: I think the demo promotion is over. It's been running for almost half a year now. Excellent week this time around - which is a first in a long time. Nice to see it expecially on DSiWare. Finally my DSi Shop points are drained, and now I'm getting ready for the big system update expected near the end of the month! Whining was back when we were getting solid games nearly every week and people were still complaining. This is not willing to put up with bullcrap. @42 uh....what? I have two psx's and both are in mint shape, and also Final Fantasy Anthology is still available BRAND NEW, not beat up, and for a mere $15. Oh, and since it will work in your PS2 AND PS3 as well, hardly a 'beat up' console.Hell play it on your pc. AND you get Final Fantasy 5 AND 6 plus a soundtrack. That's an absolute steal for $15 rather than pay $8 for the VC version. But whatever, keep waiting. Pixelman does not have a Playstation console of any kind. @Pixelman: Lol money hardly grows on trees for me. I just happen to have my copy of FF3 that I bought on SNES brand new, and the SNES I just picked up from a retro store a few weeks ago is hardly beat up at all. In fact except for the two tone coloring it looks just like new. Besides as Mach-X pointed out you can get it on the Playstation and if you dont have a PS you can also get it on the GBA as well. Or he can wait for it to come out for the VC for $8. Which could be next week for all we know. Though the GBA port is by far superior to both the original SNES version and the PSX version. @mickey why's the gba port better? isn't it the same game with a lower resolution and a beastiary? @Mickeymac (#44): sorry to burst your bubble, but it's still whining. 'not putting up with bullcrap' only happens when you have the power to do something about it, and if Nintendo hasn't listened yet, they're not going to — not this generation, at least. I'd really appreciate it if people would stop misusing words here and acting all superior and condescending. It is in fact possible to post a negative comment without "whining". @tbd: It'd be really nice if I could post a negative comment without being jumped on and falsely accused of whining. Really pisses me off. @Tasuki: I bought my Wii so I wouldn't have to own a dozen consoles for old games that generally cost around 50 bucks (the rare and good RPGs do anyway). It's cool that you got a good deal, but not everyone gets good deals. I wasn't happy with this update, and that's all I said. Y'all please stop whining about it. @Bass_X0 The Bus doesn't come on Saturday?! BEMOAN!!!!! @tbd: if I hadn't posted at all? That makes a lot of sense. 12 was a response to warioswoods' question. It's basic manners to answer a question when asked. Also, sighing is hardly whining. I was like, "sigh, another week of waiting for FFIII without knowing wtf is coming next." if that's whining then every negative comment ever equates whining. Whining is a strong and insulting term and I don't take kindly to being accused of it, especially when it's completely false. I try not to overreact and all but I absolutely hate taking crap lying down. And when people are flippant and careless with strong terms. @Tasuki: that was uncalled for. knock it off; ignore it if it bothers you so much. Oh and no hard feelings Tasuki. Did someone call for a fight to the death? Lemme grab my swords! Is this a bad time to ask what the controls are for MDK2? They weren't listed in the product details. @Pixelman: Np man its cool, Just be patient thats all I am sure FF 3 will be out in NA soon enough till than theres no point in getting upset that FF 3 is not getting released thats all. I just dont see your point in having to negatively comment every week till FF3 is released thats all. Didnt mean to jump all over you. I ain't getting upset, but I'm not crying tears of joy either, lol. It's not like I'm ranting or leading campaigns or petitions or anything... Just commenting because I like commenting. That's kinda why I registered on the site in the first place. Also it takes like 2 seconds to comment, so it's not like I'm going out of my way to, uh, whine. nunchucks are so last-gen, /me pulls out chunky gamepad w/ 6 inch screen in the middle! I've played MDK2 for about an hour, definitely worthy of a buy. The only significant issue I've had is with the control mapping, which has the fire button on the nun-chuck and uses the B button to jump. It's like shooting a pistol goofy-hand, and I find it surprisingly difficult to get used to my right trigger finger relegated to leg control. Especially since the left hand controls movement (with the exception of jumping) and the right hand uses the Wii Remote to aim...but not fire...the weapon. Whatever. I'll get used to it eventually, and the game is certainly fun, and looks pretty darn good to boot. when is the review for MDK2 coming? even a 1 line post saying if it's fun or not would be fine, I don't care about the details as long as it's a legitimate version of the game. @65 Can you use the Classic Controller? I might not buy it if there is only wiimote and nunchuck support. But, really I do love this game. I've owned it on the dreamcast and the PC and would love to have it on the Wii. Oh, and #66, let me restate, "the game is certainly fun." Yeah just get MDK2 it's not a bad port at all. The source material is great as well. Just finished playing the first level and my feelings so far are that this is "must have" on wiiware. Great port of an even greater game! thanks to everyone who recommended it!